While PDT is a powerful light-induced cancer treatment, it is often limited to surface cancers due to the low penetration of light through biological tissue. This wireless approach enables PDT to be used on the inner organs of the body with fine control. This technology could potentially enable PDT to treat a wider range of cancers, such as brain and liver cancer. The study was led by Professor Zhang Yong and Assistant Professor John Ho, who are respectively from the Department of Biomedical Engineering and Department of Electrical and Computer Engineering at NUS Faculty of Engineering. The findings of the study were published in the Proceedings of the National Academy of Sciences (PNAS) on 29 January 2018. Assistant Professor Ho said, "Our approach of light delivery will provide significant advantages for treating cancers with PDT in previously inaccessible regions. Powered wirelessly, the tiny implantable device delivers doses of light over long time scales in a programmable and repeatable manner. This could potentially enable the therapies to be tailored by the clinician during the course of treatment." PDT is a treatment method that uses a light-sensitive drug, called a photosensitiser, that is triggered by a specific wavelength of light, to produce a form of oxygen that kills nearby cells. This provides a precision approach to cancer therapy that overcomes many of the whole-body side effects of classical drugs such as chemotherapy. In addition to killing cancer cells directly, PDT shrinks or destroys tumours by damaging blood vessels that nourish them. PDT may also activate the immune system to attack the tumour cells. However, PDT has so far been limited to the treatment of surface cancers. Traditional light sources such as light-emitting diodes (LEDs) or lasers may be used for surface tumours such as skin cancer, but the low penetration of light through tissue limits the depth to less than a centimetre. For the inner lining of some organs, such as the oesophagus, an endoscope—a thin, lighted tube used to look at tissues inside the body—can be used to insert a fibre optic cable, but other regions cannot be easily accessed by this way. For organs such as the brain or liver, the organ must be exposed by surgery to use PDT. The NUS team's novel approach is achieved by inserting a tiny wireless device at the target site, extending the spatial and temporal precision of PDT deep within the body. The miniaturised device, which weighs 30 mg and is 15 mm3 in size, can be easily implanted, and uses a wireless power system for light delivery. Once the device has been implanted at the target site, a specialised radio-frequency system wirelessly powers the device and monitors the light-dosing rate. 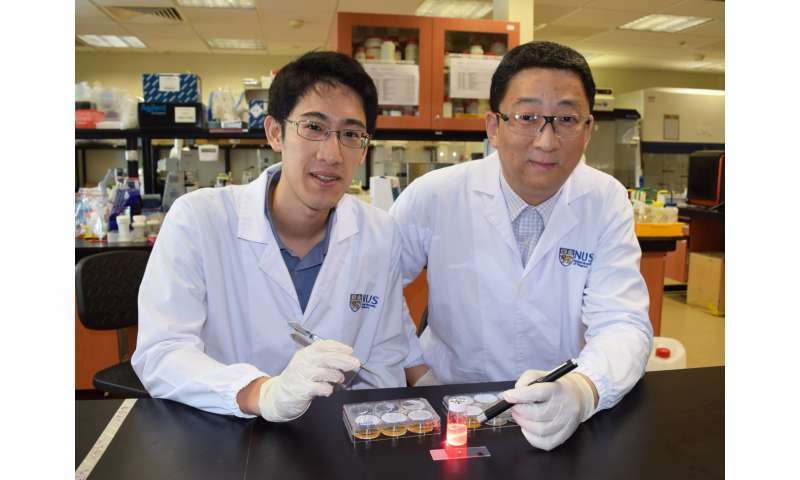 The team demonstrated the therapeutic efficacy of this approach by activating photosensitisers through thick tissues—more than three centimetres—inaccessible by direct illumination, and by delivering multiple controlled doses of light to suppress tumour growth.